HOME > the studio of art restoration . . .
NADIA PRESENTI. Graduate of the Istituto d’Arte “Duccio di Buoninsegna" Siena, Italy. Studied the ancient art of tempera painting on gold background in the Sienese workshop of Master Pettini (student of Icilio Federico Joni). In 1991, graduated as Cultural Heritage Restorer after a four-year Professional Training course given by the Region of Tuscany, specializing in the conservation and restoration of paintings on canvas and on wood panel under the supervision of Marco Ciatti and teachers from the Opificio delle Pietre Dure, Florence. Since 1991, has practised as Professional Restorer for many Italian museums and public and ecclesiastical authorities. 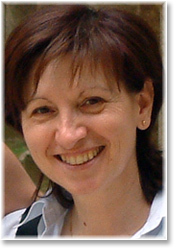 Art Expert and Technical Advisor for the Court of Arezzo. Carries out important restorations for the Cultural Heritage Superintendences of Arezzo and Siena. Author of numerous publications on the conservation of paintings. As a freelance art expert, collaborated from 1994 to 1998 on the design of window displays for the most important international stores of the fashion firm I Pellettieri d’Italia (Prada). In 2005, received the Diploma of Merit at the “Fidelity to Work and Economic Development Prize" ceremony held by the Chamber of Commerce, Industry, Craftsmanship and Agriculture of Arezzo.